Does Amazon ec2 have “Get System Log” for the command line (CLI) API? Yes! I didn’t realize this at first. I was searching for API tool for getting system log and ec2 command line system log and I even looked at all the ec2 command looking for the word log – but there is a trick. If you want to be able to grab the data that you grab via the web interface at console.aws.amazon.com: I hope this answer the following questions: ec2 “get system log” command line ec2 “get system log” command line ec2 cli system log ec2 get system log amazon ec2 api get system log amazon ec2 system tools Then you need to use the following ec2 command: ec2-get-console-output SYNOPSIS ec2gcons ([ec2-get-console-output]) ec2gcons [GENERAL OPTIONS] [-r] INSTANCE GENERAL NOTES Any command option/parameter may be passed a value of ‘-‘ to indicate that values for that option should be read from stdin. DESCRIPTION Display the instance’s console output. The INSTANCE parameter is the ID of the instance’s console to retrieve. SPECIFIC OPTIONS -r, –raw-console-output Raw output. Do not escape the console output. If not specified ^ESC is escaped and multiple blank-lines are folded into one. Amazon EC2, CloudFront, and all of the other Amazon Web Services have received a CSS / Design refresh after a few years of using the previous design. 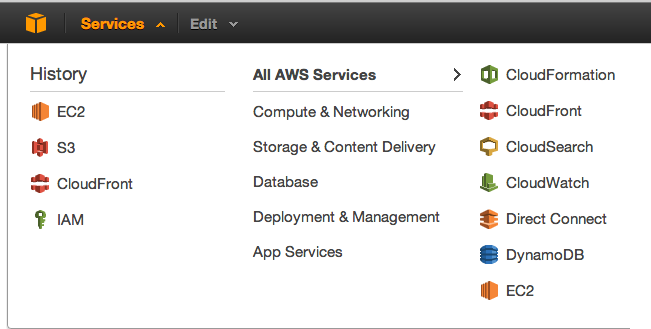 A few highlights on the new design: Dropdown Selection of all AWS Services This has been available for at least a few months. Amazon was adding so many “tabs” to the previous horizontal layout that they ran out of space. Configurable View Options Much like WordPress’s “Screen Options” Amazon has added some settings for how you view items in the toolbar: Collapsable Sidebar Amazon now gives you the option to collapse the sidebar more easily (previously you could resize it). Toggling it is a more effective way to quickly see more of the columns in the panel on the right. Quick Toggle for the Properties Panel There are now three icons in to quickly toggle sizes in the Properties Panel at the bottom There have been a few other changes to try and make the panel more “responsive” and friendlier for small screen sizes. However, I would still rather use a mobile app to manage EC2 instances on my phone. I was getting a message when using Amazon EC2 command line tools: Do you want the application “java” to accept incoming network connections? You can open your firewall and security settings preference pane and click on “Firewall Options”: You might be tempted to add /usr/bin/java to the list of acceptions, but that actually won’t cut it. You’ll still get the firewall warning when running Amazon Web Services Command Line Tools. If you open terminal and run echo $JAVA_HOME it should show you the path of the java it’s using. For me this was located at: /System/Library/Frameworks/JavaVM.framework/Home/ What you’ll find in that folder is a bin directory and a java file inside that: /System/Library/Java/JavaVirtualMachines/1.6.0.jdk/Contents/Home/bin/java If you then add that file to the list of exceptions you’ll stop receiving this flash of a popup that is prompting you to accept: Do you want the application “java” to accept incoming network connections?